They're calling it the “Storm of the Century,” so Eric stops at the market for provisions on his way home from work. But when the unkempt and seemingly unstable young woman in front of him in line comes up short on cash, charity takes hold of his heart-twenty bucks and a ride home is the least he can do under the circumstances.The trouble is, Danielle doesn't really have a home. She's squatting in a cabin deep in the woods with no electricity, no heat, and nothing but the nearby river to sustain her. Eric tries to walk away, but she's his problem now-what if something happens to her? Would it be on his conscience? She'll need food, water, firewood, and that's just to get her through the storm-there's a whole Maine winter ahead. She clearly doesn't realize the trouble she's in. But neither does Eric; the snow is coming down with historic speed and violence.After Eric gets Danielle set up, he trudges back to the road to retrieve his car, only to find it has been towed ahead of the expected plows-with his cell phone inside. He has no choice but to return to the cabin. 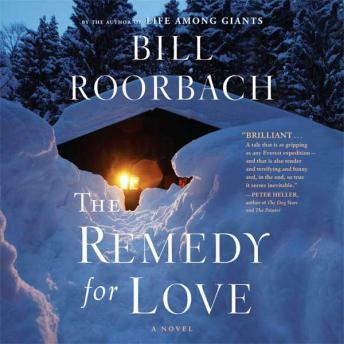 As the snow keeps mounting and drifting, they're forced to ride out the storm together, for better and for worse.Intensely moving and frequently funny, The Remedy for Love is a harrowing story about the truths we reveal when there is no time or space for artifice.